Taichi Mashima reflects on the possible futility of his life. 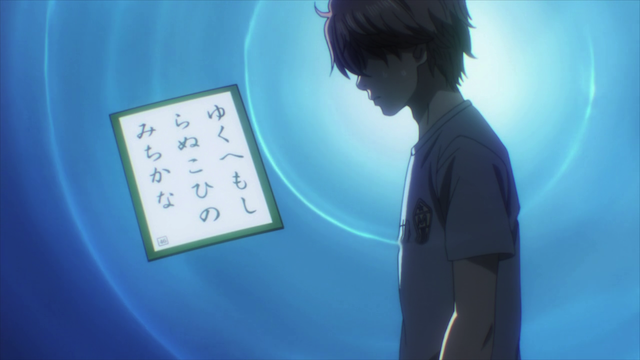 Chihayafuru season 2, episode 19 brings us the end of the National high school Karuta team championship. I know there are some who were upset that this was a three episode long game, but it is obviously the climax of the series, so it had to be one of the longest games offered. Certainly there are still some things that need to be wrapped up before the end of the season, but if one thinks back to the very first episode of the first season, the show has been motivated by Chihaya’s desire to play Karuta with her friends. The game of Karuta is really played one-on-one, so the only real chance to experience the camaraderie of team play is while they are in high school. Everything from the very first time we saw Chihaya in the very first episode (hanging up a sign to advertise the Karuta club), the flashback to her experience playing with Arata and Taichi as a team, her insistence on getting new members this season (when everyone else thought she should be practicing for the Queen tournament), even her willingness in this match to play with a damaged finger, knowing full well that continuing to play in the team match would make it unlikely that she could play the following day in the individual tournament. I’m not going to deconstruct the match. It was interesting, but I have been wrapped up in this match for so long (they actually started the Naniwa poem 4 weeks ago), that I am ready to set all the tension aside. Instead my mind is lingering over a 10th century poem that Kanade explains during the match. Drifting from the mouth of the Yura River into the sea. Where this love will take me, I do not know. The poem is associated in the episode with Taichi, who is a pretty remarkable character. He has gone from spoiled brat, that I would have enjoyed punching in the face, to a pretty decent person, who has an unrequited love for Chihaya. But even more than his possibly doomed romance, this poem seems to be about another aspect of his character. Usually Taichi struggles to achieve his dream. In Karuta he is willing to go to other cities to compete so he can gain a class-A ranking. Fate, however, hasn’t been kind. Earlier the series took some time to point out that despite all of his hard work, the one thing he is lacking in a pinch is luck. Since he doesn’t believe in luck, he takes his losses as personal failings. In this match, however, we see Taichi try to change. For once, he relinquishes responsibility. He realizes that there is nothing else he can do, and thus, he becomes like a boat without a rudder: taken by the current. I still think it is possible for Taichi to play well in the individual tournament and earn his class-A ranking, but I don’t fully understand the rules on class advancement. We have about 5 episodes left, so there is still time for one more substantial arc before this series is over. How are the producers going to wrap things up? So basically, if Taichi gets first place in the B-class division of the individual tournament, he’s A-class. If he get’s second place (as he did in season 1), he’s still in B-class. I was hoping the rules were something like that. If that is the case I think he will win the B-class individual tournament. I think he is due for a big win. You bring up a really good point about Taichi relinquishing his responsibilities and taking the poem to heart. This is what I really enjoy about Chihayafuru – how it links the stories behind the poems to the characters and their struggles. I found myself rooting wholeheartedly for Taichi the entire time. The way they make the poems an integral part of the show is one of my favorite parts as well. Taichi really is a great character. He is very flawed in several ways, but that just makes him seem more human. the first season is about chihaya wanting to be queen. this season is about taichi breaking away from the norm and aspiring to be more than chihaya’s match. who will be next season’s focus? i am hoping for arata’s focus and more airtime. hahaha! I also would like to see Sumire play in the individual tournament. She’ll probably end the season a D-class, but it would be nice to verify that she grew to like the sport by the end of the season. yes. it would be better if she had grown to love karuta more than taichi. I’d like to see Taichi advance too, but didn’t he just use up his luck winning against Fujisaki? Compared to the other characters, I think Taichi is the most complicated. He’s never played Karuta for the love of Karuta – he’s played it for two very specific reasons: his love for Chihaya, and his rivalry against Arata. His genius ability to “memorize” cards has been showcased a number of times, but this one episode shows how he’s starting to reach beyond what he knows he can do well. I can’t even begin to think about Chihayafuru ending because this has to be one of the best shows I’ve ever watched! I know. I hope they manage to score a third season, because they obviously have some more things they can do with the story. I would hate to see a show this good end at an arbitrary point. I think they have a specific end point in mind (I haven’t read the manga, but I am guessing it is the end of the National tournament. I hope you are right about a third season. They are doing such a good job with this series that it would be a real shame to end it here.